extremely youthful age. Today, following 55 years old of marriage their affection is as yet sizzling as though they just got recently wedded. Can you recall the first day you met your wife? 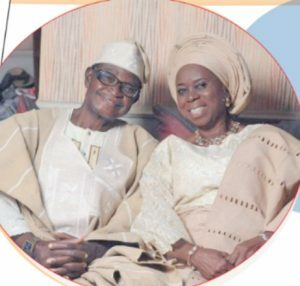 Husband: We first met each other in 1958 when I was in secondary school. She came to Egbe where I was attending Titcombe College, now in Kogi State, when there was an advertisement for a nursing programme. Wife (concurs): That was where I saw the charming man. Wife: A lot of good qualities. He was very charming and also a complete gentleman. I saw a bright future in him. He was a sympathetic person. How did you eventually get married? Husband: We just got to know each other and be- came friends at that time. Wife: We didn’t know that we were coming together as husband and wife. Husband: It was God that did it. We didn’t even date. We eventually got married on the 5th of September, 1963. Wife: Having met at Titcombe College at that time, I cherished him. However maybe he was thinking along the same line in his mind. I wouldn’t know. So during the holidays, he came to Ilaorangun in Osun State where both of us come from, for a holiday. In those days, during holidays, boys used to move around looking for girlfriends. One day he came to my house with a group of friends. They were four in number. And I liked the way they dressed. They were all dressed in white. They came to my house and we were two then – my late sister and myself, so one wouldn’t know whom they really wanted. When I saw him, I remembered the first time I saw him at Egbe. To God be the glory, that we were able to get married. He didn’t propose formally by telling me he wanted to marry me. But he just kept coming and as he was coming, other suitors were running away and we were able to form a bond by the grace of God. Did anyone oppose the marriage? Husband: No, no one opposed the marriage. Wife: My daddy was very happy. He loved him that time, but there was just a little religious problem. He was a Muslim and I was a Christian, but it was resolved amicably. Husband: I came from a Muslim background but right from the beginning I wasn’t interested in Mus- lim religion then. There was a church near my house, which I used to attend, and later I became a Baptist. Why didn’t you like Islamic religion? Husband: Though born a Muslim, I was attending a Christian school, so that made me have a Christian mind right from the beginning. What are some of the early marriage challenges you faced? What were your early days in marriage like? Wife: He started teaching when he left the secondary school. After that, he went to work with Electrical Corporation of Nigeria (ECN) who sent him to the United States of America (USA) for training. I really cherished our early days in marriage, we were young then. He bought a bicycle and with this bicycle, he would take me to school first even with my pregnancy because I was a teacher then too, before going to his own school. We continued like that until God continued to elevate us. We are not too comfortable now, but we are not lacking. I am giving glory to God for that. How did you cope when he was away to America for his training? Wife: Then I was in their house with his parents. My mother-in-law was a very nice woman. She cared for me and my child. I loved and cherished her till her last day on earth. When my husband came back from America after his training, he was transferred to Akure and after some time, I was taken back to Lagos. Then I already had two children and they were left with my parents-in-law, while I was alone in Lagos, and because I was alone in Lagos, men were approaching me for marriage, not knowing that I was already married. So I told my husband to come and take me back. When we first came to Lagos, for almost three months, I was with my sister, late Mrs. Dupe Ojo, in her house and my husband was living with his friend, Chief Bisi Akande, because of accommodation problem. How did you eventually settle down in Lagos? Wife: One would be grateful to those who helped us. I was helped in the school by the late Mr. and Mrs. Tunji Fajeyi. Also, it was through the help of Chief Bisi Akande, late Pa Oyebanji, and Pa Braimoh, that we were able to secure a mini flat where we lived for 22 years. We raised all our children there. It was Pa Braimoh that was living in the house and three of them were friends. So I will continue to appreciate what God has done for me through them. The couples of nowadays would not want to endure to make a success. Does he still have those qualities you saw in him before you got married? Wife: Yes, he has all those qualities till date, else one would have called it quits, but by the grace of God we are keeping up fine. Husband: I like everything about her. I can’t say particularly one reason I like her. She is loving and has been so since I first met her. Does your husband get angry? Wife: Yes, occasionally, but when he gets angry, we discuss and find a solution to the problem. The person that offends the other apologises. It is I who use to flare up but after some time, I would calm down and he would apologise and it ends there. How do you know when your spouse is angry? Wife: He would be too quiet and I would want to find out why, and we would eventually resolve it. Husband: She does not keep quiet whenever she is angry. So what I do is that I would start keeping quiet when I discover that she is angry, and after some time I would talk to her. Wife: At times he would stroll out and by the time he comes back, the whole thing is forgotten. Is there anything she does that you don’t feel comfortable with? Husband: Nothing I can remember that she does that I don’t like. When she gets angry I just cool her down. Did you start having children immediately you got married? they did not give us any problem when they were growing. Having been in this marriage for 55 years, do you still sleep together? Wife: We have been sleeping together but circumstances at times make us sleep separately. Like one time when he was sick, I moved into another room. Husband: We don’t sleep together regularly but at times when circumstances demand it, we do. What’s your husband’s best food? Wife: He loves pounded yam and vegetable soup. Why do you think marriages crash these days? Wife: Couples should put God first in whatever they are doing. Also, they should endure and consider each other’s shortcomings. More so, they should be able to identify what makes each other unhappy and avoid it. What’s your advice to men who wants to go into marriage? Husband: They should love God and have patience. What do you have to tell women about marriage? Wife: They should love their husbands genuinely, respect them and take care of their homes. They should also give their husbands good food and as at when due.